First off, let’s clear up possible confusion. Today’s West Lane Inn is not yesterday’s West Lane Inn. The original hostelry of that name, shown here, is right across the road from today’s inn and looks much the same today as it does in these two postcard views — with one big exception: The main staircase is now in the center of the porch instead of at the northeastern corner, as shown here. After its stint as an inn, the building was converted to apartments and was known as the Bluebird Apartments for many years — most of that time, it was owned by the Bacchiochi family. Today, it is still an apartment building. Why do we have two essentially identical pictures here? Well, in fact, they are the same picture by an unknown photographer (possibly Joseph Hartmann). But they are different in two ways (aside from the coloration). If you look at the top of the stairway on the monochrome picture, you will see an urn planter with a large arrangement of flowers and perhaps ferns. If you look at the color picture, only the base of the urn is there; the pot and flowers have vanished from the image. Also, some kind of overhead fixture, maybe a light, was removed at the same time. Why black out the planter? It may have been a mistake on the part of the company that produced the color card, the German printer Newvochrome. However, it may also have been deliberate, either because the postcard publisher found the planter awkward where it was shown or because coloring it would have been too difficult. Cards like this were based on black-and-white pictures that were hand-colored for the lithographic engraving process. Or it may be that the inn had stopped placing the planter there and asked that it be removed from the postcard. 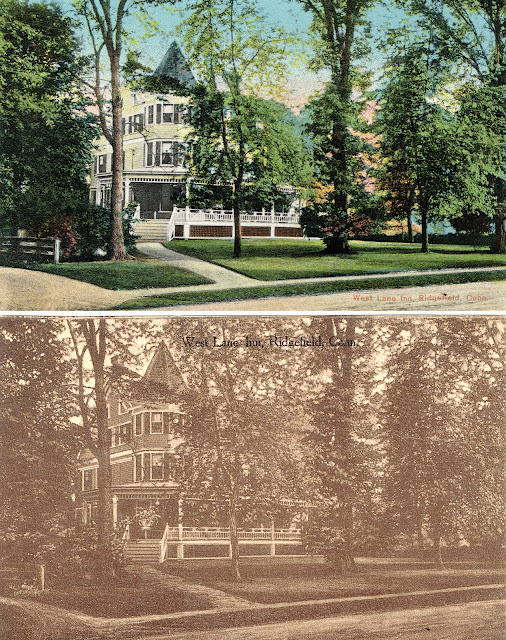 The other difference between the two cards was in how the photo technicians treated the trees. On the color card some of the leafing was removed to show more of the blue sky, possibly to give a brighter aspect to the picture. The color card was definitely in existence in 1913 because there is a dated message on the back with that year. When the monochrome version was produced is unknown. It may have been manufactured during World War I when access to German printing had ceased.